365 Church St Condos will be a 30-storey residential building comprised of a 3-storey podium and a 27-storey tower. The building would include 322 residential units consisting of 28 studio units (9%), 184 one-bedroom units (57%) and 107 two-bedroom units (33%). The remaining 3 units (1%) are 2-storey, two-bedroom grade related townhouse units along McGill Street. 365 Church Condos also includes 218 square metres (2,346.5 square feet) of ground floor retail space. 365 Church will include 161 car parking spacing in five levels of underground parking, and 225 bicycle parking spaces with 180 for residents and 45 for visitors. 365 Church Condos includes 601 square metres (6,469 square feet) of indoor amenity space on the third floor of the building, with an adjoining 122.6 square metres (1,313 square feet) of outdoor amenity space on the roof of the west side of the podium along Church Street. Register for Floor Plans and Price List. It will be Available Soon! Karma Condos is a 52 storey building located at the prime Yonge & College intersection. CentreCourt Developments has partnered with Lifetime Developments to co-develop a multi-use high-rise residential condominium at 21 Grenville Street. The Karma Condos is centrally located in downtown Toronto and is within walking distance of Toronto’s major employment districts, Ryerson University, Yonge Street shopping and numerous restaurants. The city’s major hospitals and University of Toronto are also within close proximity. Public transportation is in immediate proximity with the Yonge subway within one block of the site. It’s all good. Living at the center of the city, happens to come with style. This statement if perfect urban living is designed by the vulnerable architectural firm aA. The lobby, amenities and modern interior designers at Cecconi Simone. Enter KARMA Condos. Chrome accessory package including towel bar and toilet paper holder, where applicable. *As per plan from Vendor’s Samples. Please see a Sales Representative for details. *Prices and promotions are subject to change without notice. This is the aesthetic of Context King West Condos. A real building for real people. Shared spaces and organic architecture that encourage connection, community and design for everyone. Brought to you by Context, Toronto’s most award-winning developer whose projects command some of the highest rents and resales in the Toronto market. Context King West Condos combines two types of design. Warm and welcoming grounded brick archways. Contemporary, light-filled geometric shapes. A distinct environment whose unity is based on the connective roots of community. No memberships. No lineups. No restricted access. Creating a new village in the urban environment. Context King West is a new alternative for condominium living. It’s a reaction to the provocation and demands of the area. Context King West Condos is the answer, reconnecting the area with honesty and authenticity. 9’ ceiling heights except where bulkheads occur. Individually controlled heating and air-conditioning via state of the art system. 4” square edge baseboards with paint grade finish and slab doors with modern hardware. Front loading washer and dryer. Porcelain tile flooring on acoustic underlay in foyers (where applicable), kitchens, and bathrooms with choice of porcelain or engineered hardwood in living/dining areas and bedrooms. Custom designed kitchen cabinetry in a variety of colours and finishes with integrated appliances and matching panels for fridge/freezer and dishwasher. Stone countertops and custom coloured backpainted glass backsplashes. Designer selected under mount single bowl stainless steel sink and high-arc single lever faucet with pull out. Designer selected single lever faucet, shower head, valve, tub filler, and two piece modern toilet. Tiled floor to ceiling feature wall in master en-suite or in the bathroom of single bathroom units with tiled tub surrounds and tiled shower walls (as per plans). CONTEXT KING WEST is a new alternative for condominium living. It’s a reaction to the provocation and demands of the area. “Give me a place with community. A place with purpose.” CONTEXT KING WEST is the answer, reconnecting the area with honesty and authenticity. Pre-wired telephone and cable television outlets. 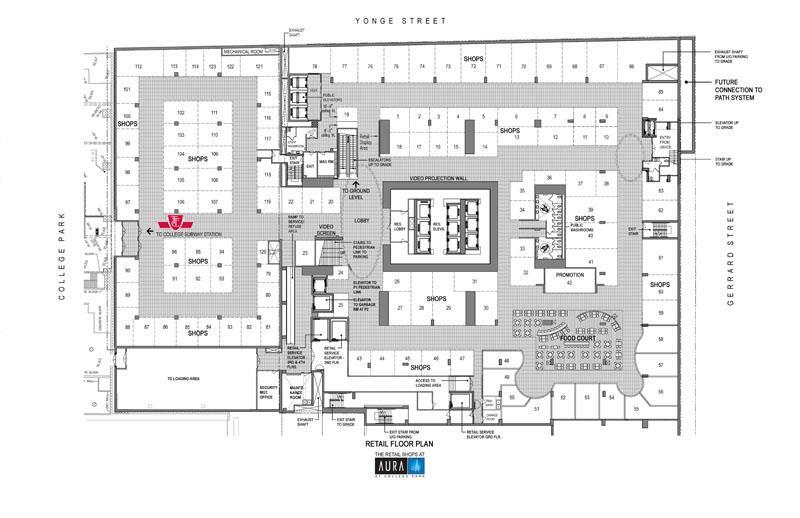 Aura Condos, Canada’s largest condominium tower is coming soon to the corner of Yonge and Gerrard. Aura Condos will not only alter the skyline of Toronto forever, but it will change the way you think about downtown living. Seventy five stories of sculpted glass and stone, graceful and commanding, while projecting an aura of luxury and sophistication. Canderel Stoneridge has a reputation for exceptional design and elegant appointments, this is their master-work. Suites that surround you with natural light and supernatural views. Features and finishes that express your style and ignite your soul. And an A-list of building amenities designed to entice, pamper and impress the most discriminating residents. Towering 75 storeys high above downtown Toronto A monument of glass and stone that will alter the skyline Undoubtedly a masterpiece in modern architecture Aura Condos At College Park is Canada’s Largest Condo Tower. Aura Condos will offer residents an elevated living experience like no other. Direct underground access to the College Park subway and shops, 190,000 sq ft of prime retail shopping at the base of the building, a world class recreational facility, exceptional finishes in each residence and out of this world views of Toronto’s skyline. Individual suite metering for hydro consumption (subject to Hydro protocols). Access controlled elevators to individual floors where applicable ensure the ultimate in personal security. The ceiling height of the unit is approximately 9 feet except in areas with bulkheads, dropped ceilings, and in bathrooms where the ceiling heights will be less than 9 feet. All ceilings to be smooth and painted white. Stainless steel, 25 cu.ft. refrigerator self cleaning, slide in electric oven, dishwasher, spacemaker microwave with built-in exhaust fan, and wine fridge. Appliances from GE Café Series. Two, single lever faucets on vanity sink in main or ensuite bathroom. One, single lever faucet in second bathrooms. Full height porcelain tiles on bathtub walls in main or ensuite bathroom. Samples and colours from builder’s packages. Engineered wood flooring in all rooms except bathroom and laundry rooms. N.B. Subject to paragraph four of the Agreement of Purchase and Sale attached hereto, the Vendor shall have the right to substitute other products and materials for those listed in this Schedule or provided for in the plans and specifications provided that the substituted products and materials are of a quality equal to, or better than, the products and materials so listed or so provided. Floor and specific finishes will depend on Vendor’s package as selected. All specifications, dimensions and materials are subject to change without notice. All floor numbers listed above are designated as marketing description. The iconic Aura Condos will now soar 78 storeys (273 meters) high above downtown Toronto at Yonge Street and Gerrard Street officially making Aura Canada’s tallest condo. Select suites from mid $500,000’s to $800,000’s. Only a select number of suites on the new floors from 36- 38 are available FOR VIP CLIENTS ONLY. A spectacular Residential Tower with views overlooking Toronto. Stunning lobby overlooking the park. 24-hour concierge and security service controlling building access and surveillance of the building. Elegant finishing details in corridors and in entrance doorways to each suite. Individually controlled in-suite heat pump system offering on-demand central heating and air conditioning. Individual suite metering for hydro consumption ( subject to Hydro protocols ). Architecturally designed, expansive double-glazed windows throughout exterior and pre-finished aluminum window frames. Landscaped entrance and arrival area. Bicycle storage room with air pump. Three guest suites. Landscaped roof top garden over podium. High Speed Elevators. State of the Art Recreation and Fitness Centre. All prices, figures and materials are preliminary and are subject to change without notices E. & O. E.
*As stated in the Agreement of Purchase and Sale. Parking spaces available for designated Units only. Floor area measured in accordance with Tarion Bulletin #22. Actual us able floor space may vary from the stated floor area. Canada’s tallest condominium offers unparalleled panoramic views of the country’s most vibrant city. Work-outs are more enjoyable in our world class recreational centre with state-of-the-art equipment and fabulous views of the city. Designer door hardware will be consistent throughout the suite. Choose one style of door hardware from a selection of two samples. In-suite smoke and heat detector and emergency button with intrusion alarm further enhances your in-suite security. A spectacular Residential Tower with views overlooking Toronto. Stunning lobby overlooking the park. 24-hour concierge and security service controlling building access and surveillance of the building. Elegant finishing details in corridors and in entrance doorways to each suite. Individually controlled in-suite heat pump system offering on-demand central heating and air conditioning. Individual suite metering for hydro consumption ( subject to Hydro protocols ). Architecturally designed, expansive double-glazed windows throughout exterior and pre-finished aluminum window frames. Landscaped entrance and arrival area. Bicycle storage room with air pump. Three guest suites. Landscaped roof top garden over podium. High Speed Elevators. Controlled elevator access to Penthouse floors. State of the Art Recreation and Fitness Centre. Sprinkler system in building to be one of the first in Ontario. The ceiling height of the unit is approximately 10 feet except in areas with bulkheads, dropped ceilings, and in bathrooms where the ceiling heights will be less than 10 feet. All ceilings to be smooth and painted white. Interior walls painted white in quality latex paint in all rooms, woodwork and trim in semi-gloss. 7” Crown moulding in foyer, kitchen, powder room, master ensuite, second bathroom, living/dining rooms, dens and bedrooms. 7 ¼” baseboards. 4” wood trim around doors. 7’ 6” Solid core contemporary style swing interior doors with designer metal lever hardware. Personally encoded in-suite intrusion alarm monitored by concierge. In-suite smoke and heat detector and emergency button with intrusion alarm. Decora switches and receptacles. Capped ceiling outlet in living room, dining room and den. Low voltage pot lights on dimmers around perimeter of living, dining, kitchen, master bedroom and master ensuite. The ceiling height of the unit is approximately 12’6”. All ceilings to be smooth and painted white. Interior walls painted white in quality latex paint in all rooms, woodwork and trim in semi-gloss. 8” plaster cornice moulding in foyer, kitchen, powder room, master ensuite, second bathroom, living/dining rooms, dens and bedrooms. 7 ½” baseboards. 4” wood casings complete with backhand. Solid core contemporary style swing interior doors with designer metal lever hardware. Personally encoded in-suite intrusion alarm monitored by concierge. In-suite smoke and heat detector and emergency button with intrusion alarm. Low voltage pot lights on dimmers around perimeter of living, dining, kitchen, master bedroom and master ensuite. Sub Zero and Wolf gas appliances. Custom designed kitchen. 5 bedrooms and 6 bathrooms. 3 ¼” x ¾” thick custom-stained hardwood flooring. Kohler Fixtures throughout. Marble, granite or limestone in kitchen and bath. The Retail Shops at Aura has been a huge success with businesss owners. Only 7 retail units remain! It’s not too late to own a coveted retail investment on the concourse level at the busy intersectin of Yonge & Gerrard in downtown Toronto. Construction is almost at street level with possession date targeted for Summer 2011. Times Group Corporation plans to unveil the spectacular new 36-storey condominium tower at Toronto’s lakeshore in Etobicoke. With breathtaking views of lake Ontario, Mimico River Ravine and the city. Key West Condos offers luxurious resort-style living at surprisingly affordable and very competitive prices. You will own a piece of one of the fastest growing newly developing and exiting neighborhoods, with superb accessibility by road or public transport and on the doorstep of beautiful parks and the lakeshore. 2% Discount on Selling Prices. One Day sale ONLY. Times Group Corporation presents one of the most exciting Lakeshore Etobicoke real estate developments ever. Called the Key West Etobicoke condo tower, this new Times Group Corporation’s high-rise will be featured at 36 Park Lawn Road Etobicoke ON with an eventual completion in the summer of 2015. With the public grand opening expected to launch in January 2012, now is the time to secure your pre-sale Etobicoke Key West Toronto condo at a discount price point. And with over one third of all available pre-construction condominiums already sold out at the new Etobicoke Key West Condos by Times Group Corporation, now is the time to express your interest for his new Lakeshore Etobicoke real estate development. The signage and billboards as well as online advertisements will likely start right after the winter holidays. The exciting project is located in a booming area with lots of future growth potential and the key selling features for the pre-construction Etobicoke Key West condos include competitive and affordable price points, high quality and modern architecture. In addition, the new Key West Etobicoke Lakeshore condo tower will provide excellent views of the city and water in addition to great accessibility to the town centre, waterfront, services and amenities. Also, public transportation is just outside the door at Union Station and major highways are also very close by. Mimico River, green spaces, public parks, community centres and outdoor recreation are also within walking distance from the Lakeshore Etobicoke Key West Toronto condos by Times Group Corporation. In an interesting pre-sale condominium marketing push, Times Group Corp has opened an initial sales center at 60 South Town Centre Blvd Markham, the site of the Uptown Markham presentation office at Highway 7 and Warden. To register online, please visit http://www.keywesttorontocondo.com for more information about the new Lakeshore Etobicoke Key West Condo tower, the most exciting new development in the Toronto market. The new Toronto Key West Etobicoke Lakeshore real estate development features a spectacular 36 storey high-rise along the waterfront district. From Mimico River Ravine, Lake Ontario and Toronto city skyline views, these luxurious resort style Etobicoke Lakeshore Key West Toronto condos are very affordable and in line with the latest market pricing. This rapidly developing vibrant neighbourhood is now home to many of the infrastructure and local amenity projects that initially started just a few years ago, and now, this bustling and amazing community introduces great transit, accessibility and beautiful parks and the waterfront district, all walkable from the new Toronto Key West Etobicoke Lakeshore condo tower. Brought to you by Times Group Corporation, this affordable Toronto Key West Etobicoke Lakeshore condo represent a great ground floor opportunity to get into the neighbourhood with eventual completion in 2015. Times Group Corporation is well known for their dedication to their craft, custom service and premium quality. Luxurious lakeside living is available right now before the public grand opening. The project itself at the lakeshore Etobicoke real estate district will feature a 36 storey high-rise residential tower with a total of three hundred and forty three units for sale. The new release of pre-sale pricing starts from just $245,000 for the 1 bedroom suites at 535 square feet in size. 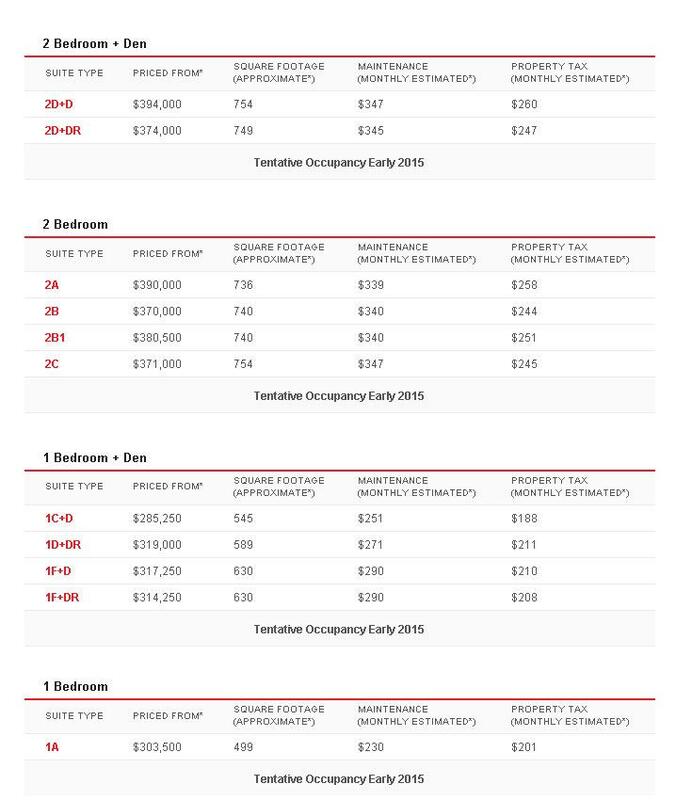 The one bedroom condos at Key West Toronto Etobicoke Lakeshore will be priced affordable from the mid $200’s.Very affordable for this neighbourhood and offering. The occupancy starts August 28, 2015 and floors 3 to 33 will have ceiling heights of 9 feet while all the others have 10 foot ceilings. HST is included with the pricing available at the sales centre. (but parking is not available for Key West Toronto floor plans 1A, 1B or 1BT or on certain floors). 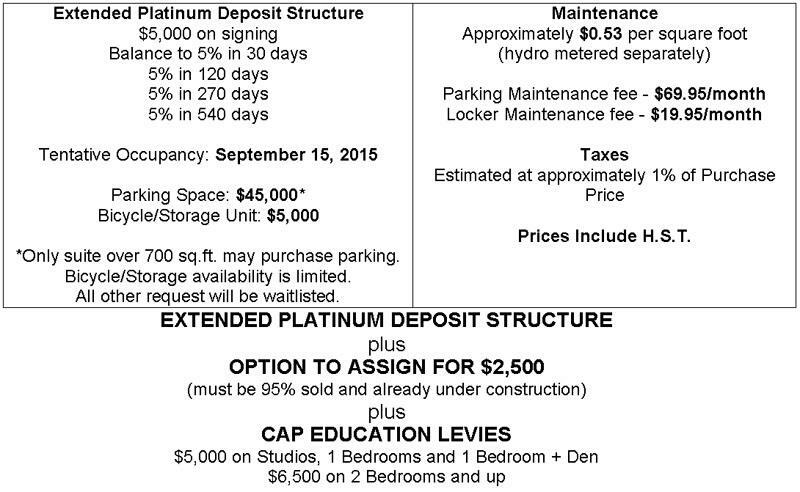 The deposit structure for Key West Etobicoke Lakeshore condos is $5000 with the offer, 5% -$5000 in 30 days and then 5% in 90 days, 2.5% in 370 days, 2.5% in 450 days and 5% on occupancy in 2015. 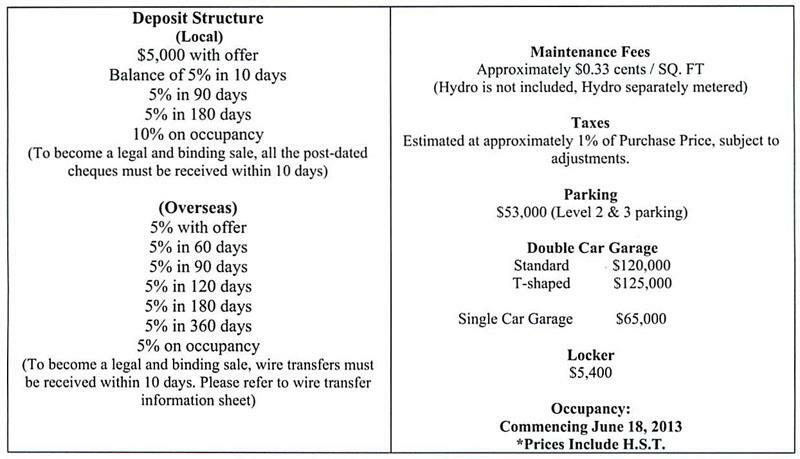 The maintenance fee will be about 43 cents per square foot per month plus locker and parking fees. 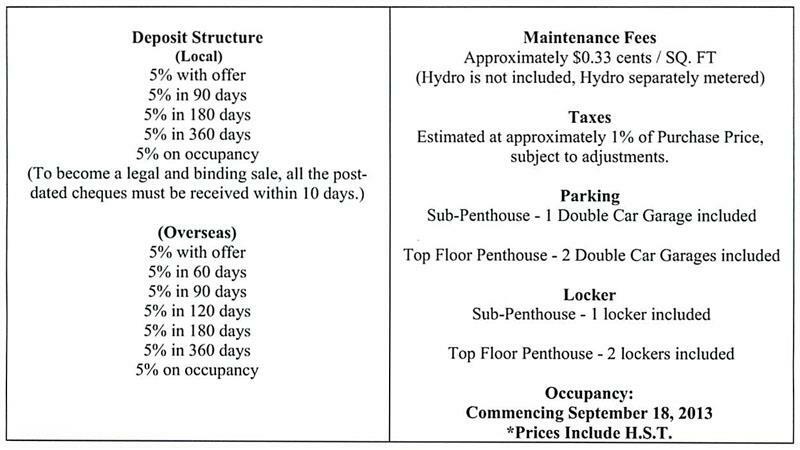 This will exclude cable, internet, and hydro (every home at the Lakeshore Etobicoke Key West Toronto condo tower is individually metered) but will include water, air conditioning and heating. The property taxes are again the 1% of the purchase price approximately. Again, the project is brought to you by leading builder Times Group Corporation. The suites at the Lakeshore Etobicoke Key West Condos will include granite countertops, undermount sinks in the kitchen and washroom(s) in addition to white smooth ceilings throughout the homes. In addition, there is plank laminate wood floors in the kitchen, living room, dining room, den(s) and kitchen. All homes at the new Key West Toronto condos will come with white stacked washer and dryer located in laundry closets as well as European style appliance set that includes a cooktop, oven, fridge, dishwasher and hood fan. There are also additional features for the 2nd floor and floors 34 to 36. The Lakeshore Key West Toronto condos are located at 36 Park Lawn Road Etobicoke Ontario. Receive all the Platinum/VIP Incentives and Promotions. 2. Guarantee of making a profit otherwise I will waive the listing portion of real estate fees. 3. Free service to rent your unit first year. E-mail or call to book a visit at the presentation centre and reserve your unit in person. For those with a passion for the extraordinary, Tridel Dorsay’s new master planned condominium community on Sheppard Avenue just east of Hwy 404, will not disappoint. Introducing Alto at Atria: a gleaming modern 43 storey glass tower nestled in a park setting, accessed along a tree-lined street leading to a private courtyard entry. As a Tridel Built Green. Built For Life.® community, Alto Condos will offer high performing interior spaces requiring less energy, along with a host of spectacular amenities designed to elevate the senses in spectacular style. Without a doubt, Alto Condos’ breathtaking silhouette will make a signature statement in north Toronto. Yet its amenity offerings are designed to leave a formidable impression as well. That’s because everything about this residence has been designed to soothe the senses and delight the soul. When a location is this ideally situated, everything becomes possible. Fairview Mall is just moments away, offering a host of restaurants, entertainment and fashion-forward shopping options. Don Mills subway station is nearby, as are the everyday conveniences running east and west along Sheppard Avenue. All points downtown and out of town are also easily accessible, with Alto Condos’ proximity to TTC, Hwys 404 and 401. ** Maintenance and taxes are estimations only and are finalized on condominium registration. Contact sales centre for details. Currency calculations are for illustration purposes and may not be accurate and exclude exchange commissions. All Tridel condominiums are sold and denominated in Canadian currency. Tridel®, Tridel Built for Life®, and Tridel Built Green. Built For Life®. are registered trademarks of Tridel and used under license.